Kotagiri: Magna's focused on a product portfolio with an emphasis on electrification and autonomous vehicle technology. DETROIT -- Swamy Kotagiri, Magna International's chief technology officer, sees a wide variety of ideas come across his desk. It comes with the territory at the global supplier. "The interesting part of the job is coming across really interesting things, not just from the automotive industry," he said, speaking here at the Automotive News World Congress on Wednesday. For example, he pointed to how Magna took some learnings from a robotic operating system that was used in medical surgery and other applications. Some of that technology found its way into robotics at Magna's factories. "We have to keep an open mind," he said. "The funnel is really wide." 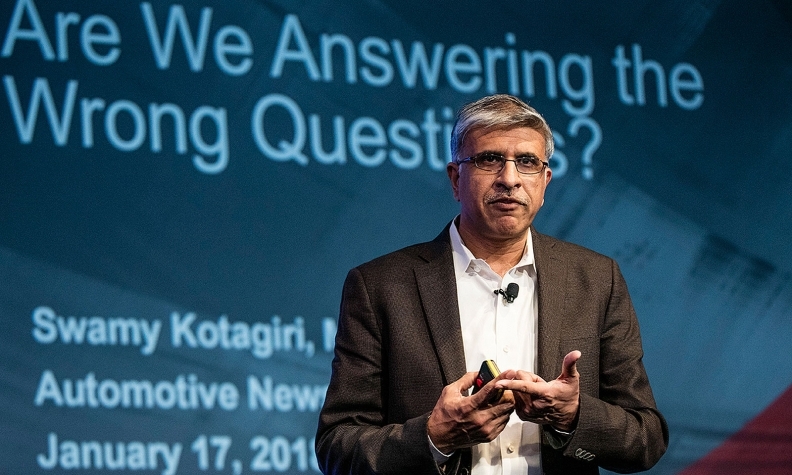 Kotagiri, 49, noted that it's important to stay focused on the product portfolio that Magna desires, such as electrification and autonomous drive, when discussing new ideas. "We go through lots of startups and some really interesting ideas from universities," he said. Even venture capitalists will pitch technology ideas to Magna, he added. "They all come and say, ' "Here is something interesting. How does Magna see it?' "
But Kotagiri has also gone out of his way to learn new ideas and points of view. Last year, he created a technology advisory council for Magna, which allows the company to hold wide-ranging discussions among individuals with and without automotive industry ties. "We know what we know and don't know what we don't know," he said. "So we tried to get broad experience. We have representation from a person who has automotive experience from an OEM. We've got representation from a university." Additionally, there is representation from China and Silicon Valley. Investments in cutting-edge innovations come at a fast pace. Just this week, Magna said it now has the ability to manufacture U.S. military-grade radar for the auto sector, allowing automakers to close the gap between Level 3 and Level 5 autonomy. The company's new Icon radar system employs ultrafine detection and scans its surrounding environment 50 times faster than it takes a human to blink. The radar has multimode capabilities, scanning horizontally and vertically while creating a high-definition four-dimensional view. Magna collaborated with Uhnder, a technology startup, on the project with the goal of bringing the technology to market in 2019. Magna, of Aurora, Ontario, ranks No. 3 on the Automotive News list of the top 100 global suppliers, with worldwide parts sales to automakers of US$36.45 billion in 2016.